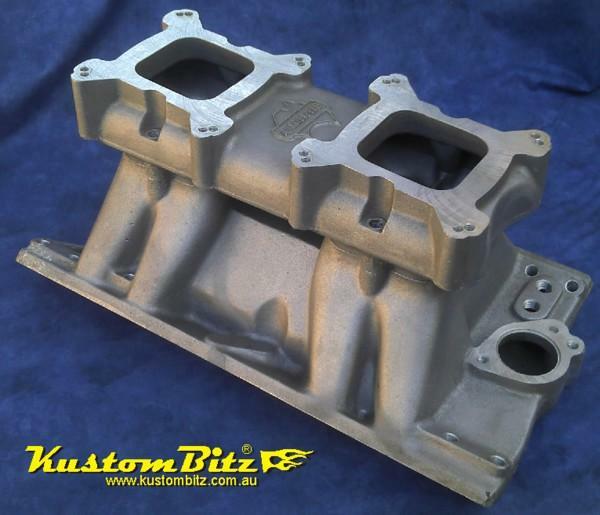 Aussiespeed Tunnel Ram Base ~ Intake manifold suits early Holden 253 308 heads does not suit later VN heads. Order Tops Separate see below. 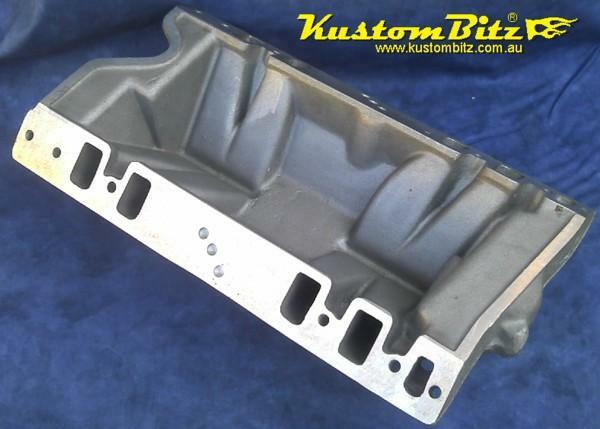 Part# AS0050 : Holden 253 308 Tunnel Rams base inlet manifold. Suits early holden heads and not the VN style and later heads, they have different port spacing. 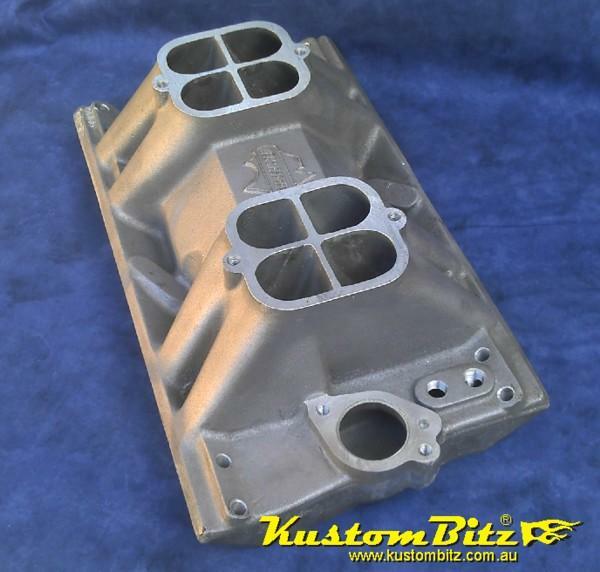 Power range for the single 4 barrel top is approx 3500rpm to 3800rpm depending on the cam, AussieSpeed has tightened up the plenum on the single 4 barrel top to increase air speed and torque at the low end, expecting that primarily it will be used more on a street/strip engine in a hot rod or similar muscle car. The bigger the cam the higher in the rpm range it will start to come in at. Typically we estimate the best street setup for a healty cam of around 235 to 245 dur @ .050 at a lobe sep angle of 107 to 110 would be a 3500 stall converter running 4:11 diff gears with a 26" to 28" tyre and it would be quite streetable for that special toy vehicle. Bigger cams may need a higher stall converter for similar diff gears. 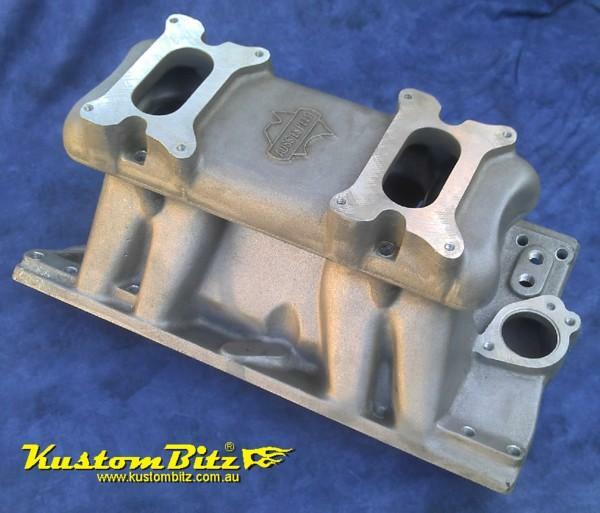 If you want the twin carby look and you primarily have a small cam / mild cam street engine in the 300 to 350ci capacity then the twin 2 barrel top would be the go for the street with a pair of 350 Holley two barrel carbs. If your cam specs are in the 212 to 225 @ .050 you could get away with a 2200rpm stall converter and a 3.7 to 3.9:1 diff gears. This would make quite a good, praticle set up for street driven engine if the tunnel ram look is what you want. A bigger cam will need 4.11:1 diff gears and a 2800-3000rpm converter other wise it will feel real doughy in the bottom end and be a bit of a pig to put around at normal street speeds. Power range for the twin 4 barrel tops is 4000rpm to 7500+rpm, recomend 4500rpm stall converters and diff gears 4.5:1 or lower. 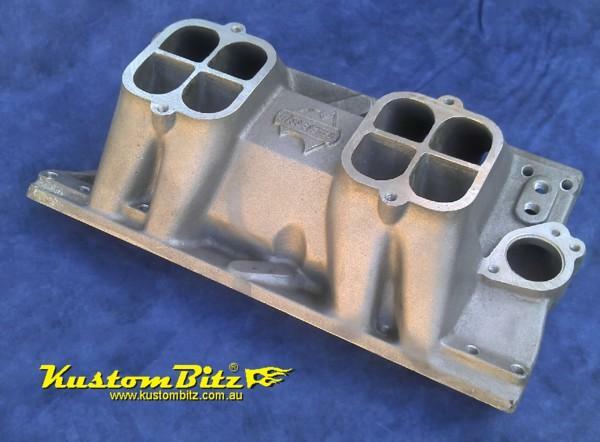 Mainly aimed at big engines with big cams used on dragsters. However if you really want to put one of these on your street driven Hot Rod with a 235 @ .050 cam then try a pair of 465 vac sec carbies on engines of 350ci and larger, you might be able to dial in a streetable package if you are a good tuner and run diff gears 4:11 or lower and at least a 3500rpm converter. Main thing to remember is that a tunnel ram intake manifold flows volumes and becasue of the size of the runners and volume of the tunnel ram tops there is stuff all air speed up to 2500+rpm so normal street gears in the diff and stock stall converters are not really going to make it that driveable becasue the fuel atomisation of wet fuels at that rpm range below 2500rpm will not be that efficient or even, with the tunnel ram. However dry fuels like LPG are a little different see below. 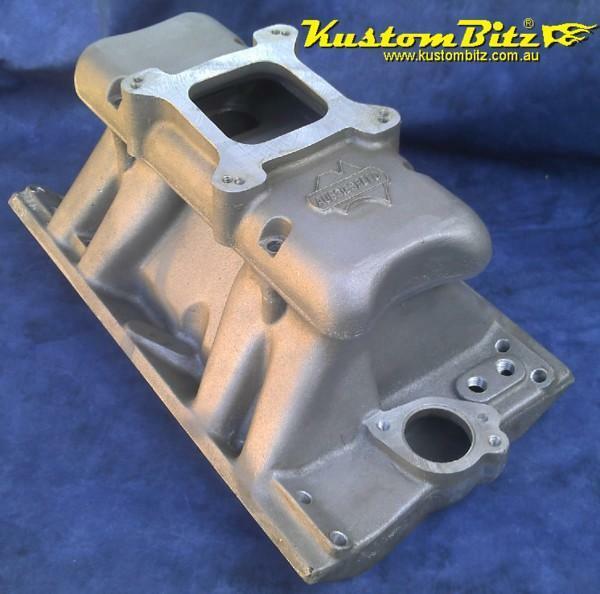 Superchargers are great power adders and work with all camshafts from stock to wild. As a rule of thumb a 10lbs boost will increase the power at any given engine rpm by 30 to 40%. So for a stock cammed engine with about 8:1 comp you will have more power in the streetable rev range and across the entire rpm range that the cam is designed to work by roughly this amount. Propane or LPG requires good engine vacuum to operate the gas converter/mixer so I will assume that your engine will have a baby cam installed to provide good vacuum, something in the range of up to 218 dur @ .050 on a lobe separtion of 112 to 114. The best set up for a gas carby engine is two imco mixers with 4 barrel Holley bases, installed on top of a twin 4 barrel tunnel ram. This set up is quite streetable and here is why, each imco carby is only rated to 400cfm so for 350+ci engines you cannot over carb the engine and becasue LPG is already a gas it does not have the atomisation and fuel drop out problems associated with wet fuels at low air speed at low rpm. So a LPG fed engine set up as suggested here would be a good street package when used with a 2200-2800rpm stall converter and diff gears 3.5 to 3.7:1 with a 26" to 27" tyre. As a rule of thumb big cam engines with high overlap on the intake and exhaust have low vacuum figures, typically much less than 15inches of mercury, which makes running LPG too hard becasue the primary converter that pre-heats the gas from the engine coolant will not work that well on low vacuum signals, so your engine starves for fuel and runs like a pig. Not real fun. 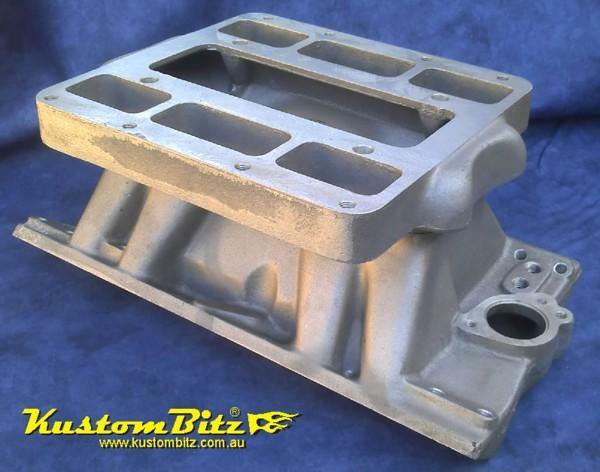 If you need to dicuss it further contact Kustom Bitz, see our contact page from the menu above. Holden 253 308 Pushrods - Super Duty Hardened 1 piece standard OEM length +0.100", 8.800"